Can you tell I'm ready to go to the beach? 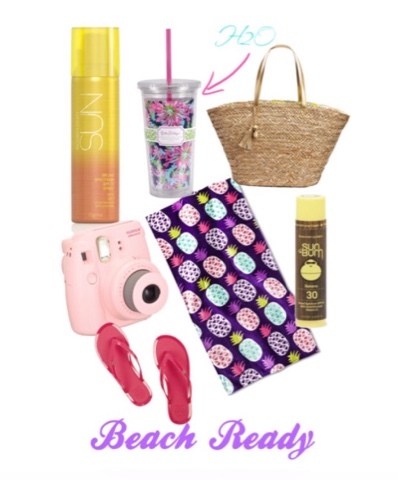 The countdown is on till I'm beach bound and these are just a few essential items that I'll be packing! Sunscreen ~ I have used the Victoria's Secret suntan lotion SPF 24 and after sun lotion for the past couple of years and I love it but unfortunately I don't see it on their website this year (have not checked the store). The lotion is thick and offers really good coverage! However, I did find this one on their website but have not tried it out myself. I have heard really great things about the Sun Bum line of products (links in widget below). These can be found at your local Target or Ulta as well! Don't forget to protect your lips too when you're out in the sun! I'm currently craving this camera! Probably won't be able to get in time for my beach trip but I'll definitely will be taking this camera to capture some great memories from my family trip! Don't forget you can follow me on Instagram here! Thanks so much for stopping by!